Sources: IPCC (2011): SRREN, Figure 10.2, and IPCC (2014): AR5 WG3: Mitigation of Climate Change, Chapter 7: “Energy Systems,” p. 561. In prior installment of our posts introducing the graphics from our book Climate Gamble: is Anti-Nuclear Activism Endangering Our Future?, we showed how the IPCC special report on renewable energy potential actually shows that most scenarios fall far short from supplying the world with enough low-carbon energy in 2050. This picture expands upon the SRREN results by showing IPCC’s latest estimates of world energy demand up to 2050. IPCC estimates that even if powerful climate mitigation policies are adopted around the world, the world energy demand will most likely be at least 450 exajoules per year (EJ/a), and may be as much as 800 EJ/a. If climate policies are neglected as they are now, the final energy use may be much higher. Since even the highest single outlier in IPCC’s SRREN report forecasts renewable energy potential to be at most 428 EJ/a, we have a major problem. 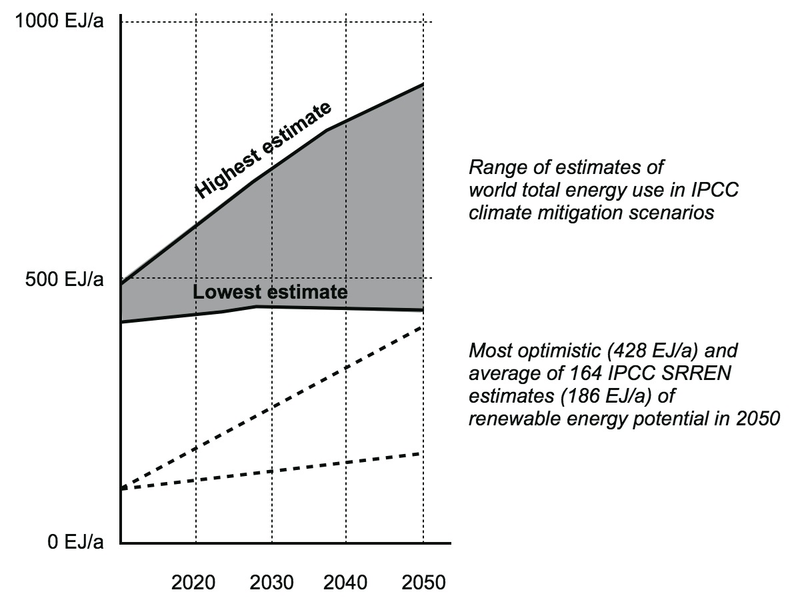 In short, the non-nuclear energy scenarios rely on two things: that renewables will at the very least succeed as well as the most optimistic of 164 IPCC SRREN energy scenarios suggests; and that energy saving measures will succeed at the very least as well as the most optimistic of IPCC’s energy demand scenarios suggests. (The next week’s installment will explain in more detail what these scenarios demand in practice.) If either one fails to deliver as planned yet alternatives cannot be deployed, we are in deep trouble. Your mileage may vary, but we feel that such optimism amounts to a reckless gamble, as we do not have a planet or plan B to fall back on. Sources: IPCC SRREN (2011), Figure 10.4, and IPCC AR5 WG3 Draft (2014), p. 66. By 2050, Earth will be home to nine to ten billion people. Most of those people will aspire to a higher standard of living, and in poor countries, this will mean more demand for energy supplies. Meanwhile, the raw material deposits the industrialized economy is dependent upon are diminishing in quality, and extracting useful materials will require far more energy inputs. Furthermore, fossil fuels need to be replaced with cleaner alternatives, and since this in many cases involves inherently inefficient conversion processes (for example, pyrolyzing biomass to liquid fuel), the demand for primary energy supplies in these applications will likely rise. For these and other reasons, almost every serious estimate of the future of world energy demand concludes that the demand will at the very least stay close to current figures, and most likely it will rise substantially. The intergovernmental panel on climate change, IPCC, estimates that even if climate mitigation is taken seriously – which is currently not the case – the world energy demand is likely to rise. A range of scenarios illustrated above trends towards 600 to 700 exajoules per year, and possibly more. If, on the other hand, climate change is approached with the current leisurely fashion, energy demand in 2050 could be much higher: quite possibly as much as 1500 exajoules per year. You can therefore understand our horror when we realized that the report many environmental organizations lauded as the “most comprehensive” report on the renewable potential so far falls very short of these goals. The report in question, IPCC’s Special Report on Renewable Energy Sources and Climate Change Mitigation or SRREN for short, assessed 164 energy scenarios derived from 16 distinct models. The report was by no means overly critical of renewables; nevertheless, its conclusions are sobering. The most positive outlier scenario out of 164 could perhaps deliver 428 exajoules per year in 2050; the average of all 164 scenarios is just 186 exajoules. If something goes wrong in either the most positive outlier scenario or in the lower estimates for world energy use, the outcome is clear: the climate is done for. Even 100 exajoules per year from unabated fossil fuel burning would probably be too much, and cause us to fail in our climate goals. And if anything unexpected happens either with energy demand or with renewable scenarios, the gap between what is needed and what is delivered can be huge. Yet all this is almost never even mentioned in public discourse. Powerful non-governmental organizations act as if these estimates didn’t even exist, and continue to imply that we could easily power the entire planet with renewables alone. In effect, they act as if the most optimistic outlier in the most comprehensive report to date is something of a “worst case” scenario for renewables, to be easily exceeded when needed. We believe this to be a huge gamble with our stable climate. At the very least, it is hard to call it responsible policy. Source: BP World Energy Outlook 2014. Kicking off the series of weekly posts with graphs and pictures from the English edition of Climate Gamble is this graph of the share of fossil-free energy as percentage of world total energy use. As we can see from the graph, fossil free energy constitutes only about 13 percent of the total, despite decades of warnings about the dangers of continuing our fossil fuel addiction. 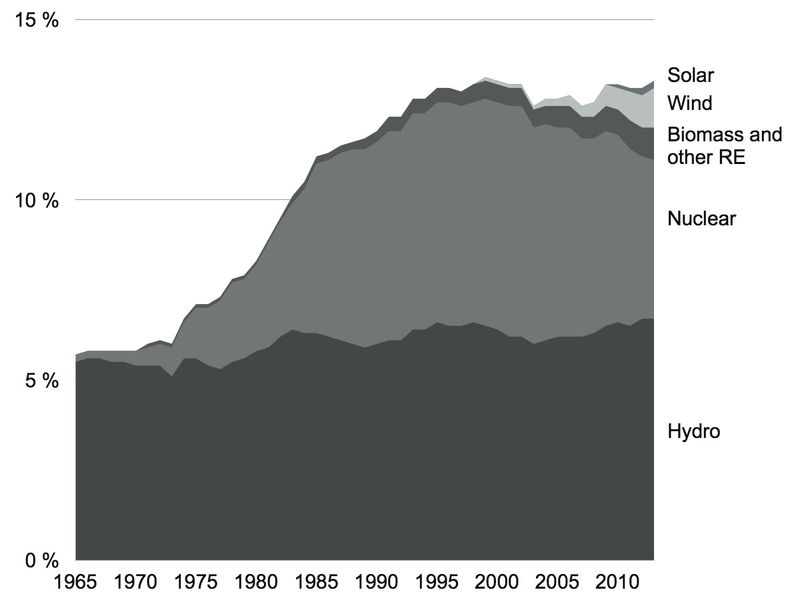 One can also see when was the last time world energy supply was substantially cleaned up: during the nuclear build-up in the 1980s. 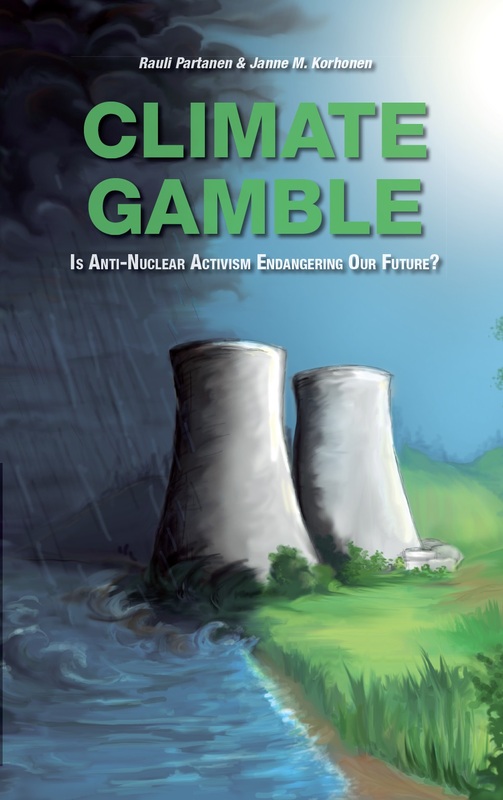 This is one reason we believe that anti-nuclear activism is gambling with our climate. 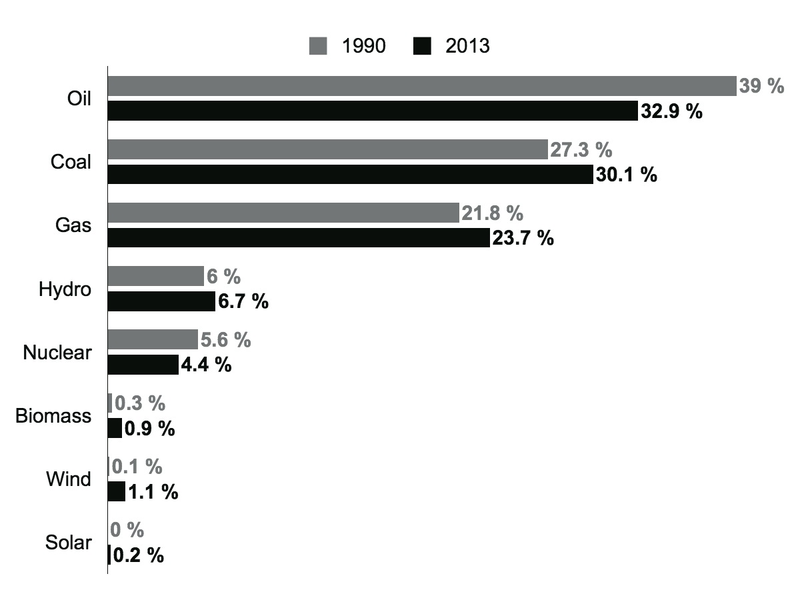 The data for the graph comes from BP World Energy Outlook 2014.